If you are looking for a Pre- or Post-conference Workshop that will also allow you to experience hands-on the city of Boston, MA, look into registering for one of our tours. The Brewing Industry Tour on Saturday, July 30 includes transportation, lunch, private tours and tastings at three distinct Boston-based breweries. These breweries will range in size, offerings, and distribution, allowing attendees to get a look into the craft brewing industry in Boston, with discussions at each stop on the economics of beer and brewing. We are also hosting an Extension Tour on Wednesday, August 3. This tour will stop at three prominent Boston locations throughout the day, and includes lunch. The first location is Fenway Park, “America’s Most Beloved Ballpark”, uniquely nestled in the city of Boston. The next stop is at Allendale Farm, an urban farm committed to protecting the health and well-being of the land they farm, as well as all the communities and environments connected to the farm by using a number of traditional organic and sustainable farming practices. The afternoon is then filled with a visit to the Cranberry Experiment Station. This outreach and research center is charged with the mission of maintaining and enhancing the economic viability of the Massachusetts Cranberry Industry through research and outreach and serving the public welfare by supporting economic development and the protection of the environment. The last day to register for all workshops is July 8, 2016. If you are registering only for a Pre- or Post-conference Workshop or would like to add a workshop or luncheon after you register, download and submit the paper form or call Lauren Seward at (414) 918-3190. Consider attending one of the luncheons or reception. Advance registration is required and additional fee applies. Visit the Luncheons and International Lecture and Reception page on the Annual Meeting website for additional details. Last day to register for the luncheons and reception is Friday, July 8 or once maximum capacity is achieved. If you are registering only for a Pre- or Post-conference Workshop or would like to add a workshop or luncheon after you register, download and submit the paper form or call Lauren Seward at (414) 918-3190 to register. How are you traveling from the airport to the hotel? The Boston Logan Airport Shuttle is available for airport transportation at a reasonable price. Use this link for a discounted rate and reserve your space ahead of time. Attending the 2016 AAEA Annual Meeting is an experience in itself, but doing so means that you’re also given the opportunity to explore the stylish sophistication and historic New England charm of Boston, Massachusetts. Here you will find culinary treasures, grand art museums, unique shopping, revolutionary historical sites, and so much more. Remember to call ahead to make reservations at restaurants, and buy any tickets for major concerts or entertainment in advance. Visit BostonUSA.com to inspire and plan the rest of your visit! 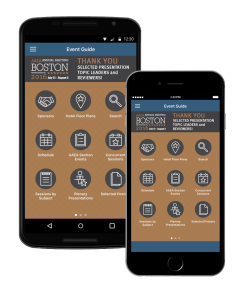 Instead of carrying the meeting's paper program, download the AAEA Mobile App onto your smartphone or tablet to veiw everything for the 2016 AAEA Annual Meeting in Boston, MA. The mobile app provides the most up-to-date meeting program that lists all concurrent session information. Download the AAEA Mobile App by searching AAEA in your phone or tablet’s app store to view the 2016 AAEA Annual Meeting in Boston, MA event. Just look for the AAEA logo, and be sure to keep this app for next year! If you are interested in sponsorship or exhibiting at the 2016 AAEA Annual Meeting, please contact Mary Annen, (414) 918-3190 or mannen@aaea.org.